Yesterday was the #GlobalDayforKobani. A day when around the world people spoke up in solidarity with the Kurdish people being slaughtered, butchered and enslaved by ISIS, the self proclaimed Islamic State. This is the fascism of our times and for the good of humanity, it must be stopped. The Labour Party has a role to play here. We are an internationalist Party, rooted in the left wing values of real solidarity, something desperately needed now. 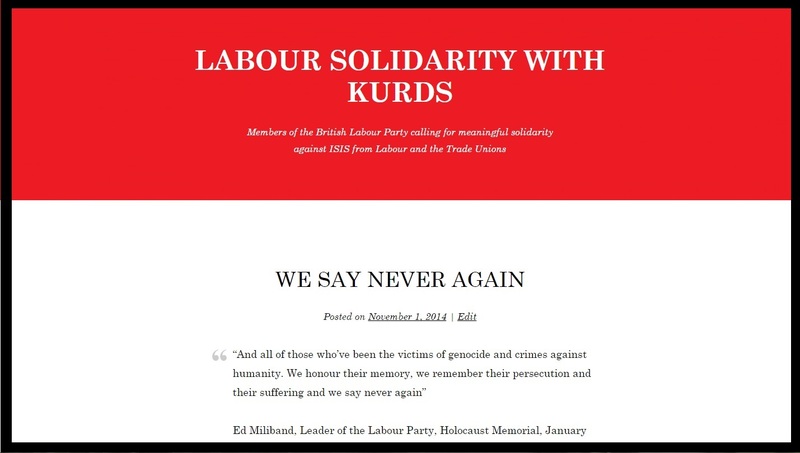 Today I and a number of other non-Kurdish Labour Party members have tried to raise the profile of this battle and urge the Left to unite behind real solidarity, including military intervention where needed, against ISIS. Released this statement, an “Open Letter to the Labour Movement”, signed by Labour MPs, and grassroots Labour members and trade unionists. I spoke on behalf of Labour Solidarity with the Kurds at the Trafalgar Square rally against ISIS. I was proud to sign the statement. All the signatories (and we welcome more) will continue to call on fellow Labour members, leaders and trade unionists to join us in calling for more help from our government to defeat this barbaric fascism. If you would like to add your name, please do so here. If you have a blog, website, twitter or facebook please help us to make sure this desperate situation does not fall off the political agenda in Britain. We can help, so we must help.